This is a guest post by Michael Davidson, who is a not-quite-so-young man living in Highland, Utah with his wife and kids. At the tender age of 14, Joseph Smith went into a grove of trees near his home in New York in order to seek knowledge from the Lord. In the vision that followed, Joseph was told by the Lord not to join any churches then extant, for “they were all wrong” and that “all their creeds were an abomination in His sight” and that the preachers of these religions and creeds were “all corrupt.” It was in this First Vision that the Lord introduced Joseph, along with the rest of us, to the need for a restoration of the Gospel. The Lord makes clear that a simple reformation of existing christianity would be insufficient, driving the point home with strong language as was and is His prerogative. It is with these two “myths” in mind, myths of Mormon monopolies on truth and salvation, that the Givens began their attack on the canonized First Vision narrative. They fault this narrative, which they claim sets the stage for the flourishing of these myths. Kurt Manwaring was kind enough to share his interview with Daniel Peterson, part of his “10 Questions” series at FromTheDesk.org. Kurt has allowed us to cross-post a portion of that interview here. Peterson is the president of the Interpreter Foundation, a scholar of Islam, and the founding editor of the Middle Eastern Texts Initiative at the Neal A. Maxwell Institute for Religious Scholarship. Kurt Manwaring: Welcome! Before we begin, could you tell us a little bit about yourself and your involvement with Islamic studies and Mormon apologetics? This is a guest post by Brother I. W. Brown. Naturally Joseph Smith is the primary focus of that scrutiny, and it only makes sense. After all, he made the biggest impact and certainly had the most to say about the formation of the church. So he had more opportunity than anyone to make mistakes – he had the most “at bats,” so to speak, so it’s possible that he had the most strike-outs! Incidentally, some of his critics remind me of someone who never played baseball bragging about having fewer strikeouts than A-Rod! Unlike the prophets of our day, Joseph did not have a mentor. He had no organization or policy to perpetuate, he had to create them (or as we believe restore them) from scratch. I don’t think we can ever appreciate the enormity of that task. Think about it. Imagine the task of building a house from nothing, for example, having never seen another house or having floorpans. Now build the house – engineering, excavation, foundation, concrete, framing, plumbing electrical, flooring, framing, finish carpentry, paint, roofing, windows, etc. No doubt a critic would come inspect your home after the fact and cite you for not knowing the right size of pipe for venting a toilet! So let’s turn to Joseph. Let’s see what we can learn about any standard he may have set for a prophet. What qualifies and disqualifies a man to be a prophet? Maybe we can use his own standard against him! Joseph Smith makes his debut as a self-proclaimed prophet in 1830 with the publication of his opus, The Book of Mormon. It turns out that we learn quite a bit about his version of prophets in the first 5 chapters of the book, 1 Nephi chapters 1-5. 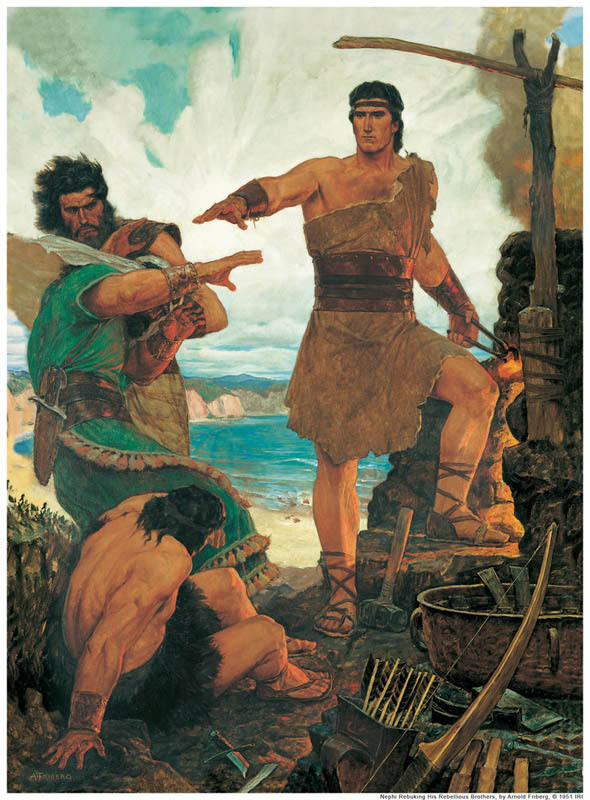 Here we meet Lehi and his son Nephi who are the prophet of the story and his next-in-charge respectively. Lehi has a vision instructing him to take his family and leave Jerusalem immediately. While Nephi is happy to comply, older brothers Laman and Lemuel are less thrilled with the idea of leaving the only home they had ever known. We might imagine that they have had experiences with their father that exposed him as less than perfect. They are put out to have to leave their lives, including all the wealth they had hoped to inherit one day. But still they reluctantly obey and follow dad into the wilderness – act of obedience number 1. They travel for three days. Let’s say that amounts to 40 miles. Apparently, Lehi’s plans were only half-baked. Once 40 miles out of town, he’s inspired, or at least realizes that he needs the Brass Plates in Laban’s possession way back in Jerusalem. Naturally, Laman and Lemuel are irritated. Why didn’t dad think of that before we left? His oversight cost them 80 miles of grueling travel. Meanwhile Nephi is quick to comply. After expressing their frustration the brothers return with Nephi and another one of Nephi’s brothers, Sam – obedience #2. After retracing their journey they “cast lots” and decide that Laman would be the lucky one to go meet with Laban to collect the Plates. Nephi is effectively the leader/prophet/priesthood on the ground. Laman again defers to his leader and is nearly killed for his troubles – obedience #3. Laban’s henchmen chase him out of town, back to where the brothers are hiding. Undeterred, Nephi remembers the riches the family had left at their home. He suggests that they can trade for the Plates. This time he’s certain the plan will work. It has to because they’re on the Lord’s errand so the Lord will provide a way (1 Nephi 3:7). Finally the brothers all agree to try again – obedience #4. But again Laban doesn’t cooperate. He steals their riches and tries to have the brothers killed. With this context in mind, it’s hard not to empathize a little with Laman and Lemuel. I’ve often thought that, at this stage of their adventure at least, they get a bad wrap. Who wouldn’t be aggravated with all they had experienced. Now I’ve never beaten my little brothers with a rod, but I’ve never been threatened and tested like Laman and Lemuel were during their trip back to Jerusalem. So after pummeling their brothers, the two are rebuked by an angel. Tempers soon cool and Nephi decides to have a go at Laban alone, not knowing exactly what to do. But still he ventures forth. He gets a little bloody in the process, but Nephi is finally successful. He not only collects the Brass Plates, but also adds a helping hand to the travel party, Zoram. But Lehi was supposed to be a prophet! Nephi too, in Lehi’s absence on the road, spoke for the prophet. Why couldn’t these men of God see the end from the beginning? Why didn’t Lehi get his act together and get all the facts before formulating a plan and demanding action? Well, if we accept that Lehi was indeed a prophet, it appears that a prophet may operate through trial and error on occasion. He may only be given “line upon line” and even have to act without “knowing beforehand the things which [he] should do” (1 Nephi 4:6). We learn about the nature of prophets in the very first pages of the Book of Mormon. We see that prophets may stumble and fail at times even while doing prophety things. We learn that, as human being and without all the information he would like, a prophet must make mistakes. We learn that the path of a prophet will zig and zag and will end up nothing like a straight line. As we ponder this and the perfectly human nature of every prophet, we may even feel foolish for ever thinking that a prophet should always have a clear and perfect vision of his mission – start to finish. We may feel foolish for thinking that obvious missteps prove that a prophet is not a prophet. Somehow we have developed an image of a prophet that is far removed from what the Book of Mormon and other scriptures clearly present. Lehi and Nephi are two of many prophets we read about who together display the full range of human frailties. Maybe it’s the result of too much exposure to characters in Marvel and DC comics or lessons from overly-enthusiastic Sunday School teachers, but we seem to have endowed prophets with superhuman virtues. Either way we end up forgetting their humanity. Of course, the point of all this is that it applies to Joseph Smith. Joseph’s life and errors are so relatively recent and so well documented that it’s tempting to apply a whole new standard to him. But such a judgment says far more about us than it does about him. And heaven forbid if his successors were to ever misstep, backtrack, or change policy or direction. The humanity of the prophets likely hasn’t changes over the millennia. Unfortunately, with respect to failing to recognize a prophet in our time, neither has ours. Bio: I’m second generation LDS. My father worked for the CES with a PhD in ancient Christianity. I left the church for 6-7 years after consuming thousands of pages of criticism of the church in general and Joseph Smith in particular. I was an atheist for that period. Long story short, about 15 years ago I began my return to the faith. Ironically, some of the issues that used to trouble the most are now what I call pillars of my renewed faith in the Gospel. Ben Spackman talks with LDS Perspectives about what scholars believe about the Genesis creation accounts, of interest because of how scholarly research informs our understanding of the LDS creation accounts found in Moses (June 1830), Abraham (1835, published 1842) and the temple (May 1842). Ben is writing a book on the creation accounts tentatively titled Reading Scripture, Reading Creation: The Ancient Context of Genesis 1. Benjamin T. Spackman has a Bachelor’s Degree in Near Eastern Studies from BYU. He then received a MA and did further PhD work in Near Eastern Languages and Civilizations (Comparative Semitics) at the University of Chicago, where he was a Hugh Nibley Fellow. He has been an Institute teacher for over ten years and has taught at BYU. Ben blogs at Times & Seasons, and writes Gospel Doctrine background posts at Benjamin the Scribe.